Buy this item and earn 4,124 ClubPoints. 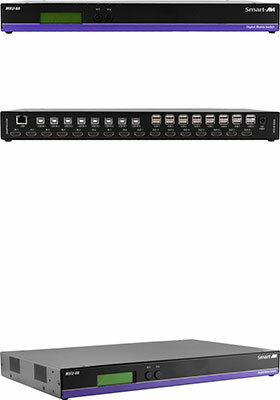 MXU-88 is a 8x8 HDMI and USB 2.0 matrix switch. It lets up to eight users easily access and control eight computers and USB 2.0 devices from eight consoles, each equipped with transparent USB peripherals such as keyboards, mice, hard-drives, scanners, as well as 4K-compatible HDMI monitors. Perfect for control rooms or group video editing suites, MXU-88 excels at expediting workflow by offering control of remote systems via USB peripherals like keyboards, mice, and more with the advantage of 4K-ready HDMI display support. Controlling MXU-88 is easy thanks to SmartAVI's simple-yet-robust design. The two-button front panel control interface allows users to switch between connected systems and devices at the press of a button. 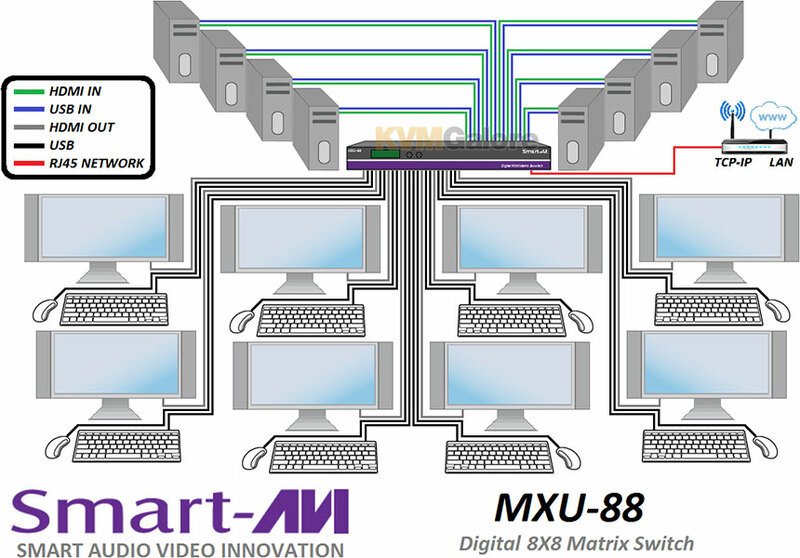 Furthermore, MXU-88 features a web-based control interface that offers comprehensive command of connected displays and peripherals via an Ethernet connection, which lets you visualize connections between consoles and controlled computers and navigate between them. MXU-88 is capable of ultra-high detail resolutions up to 4K (3840x2160 @ 30Hz) on HDMI monitors. The switch's 4K capabilities makes it an essential component in various real-world applications including control room supervision, post-production, group-based digital design work, large-scale server management, and more! MXU-88 excels in multi-user settings, and works well in various real-world applications such as remote project supervision or group-based video editing endeavors. MXU-88 is an ideal solution for medical, industrial, studio and defense applications, where it is not practical or safe to have multiple workstations in close proximity to each other. An operator can switch to any connected computer from any connected station with ease. Listed below are additional products to consider which are compatible with MXU-88. These items may be required to complete your system.